Life is cheap when school is in. Part of the perks of having a job, in addition to the whole paycheck thing, is having your time occupied so you don’t spend money. As we climb out of the Swine Flu abyss and fall back into the routine of school life, the dust is beginning to settle, and many volunteers are looking at their wallets and wondering what happened. That’s not to say that any of us broke the bank. As much as we painted the town, we only did it with one coat, and half the time we were breaking bread over 60-sene ramen in the Peace Corps office. In any case, we’ve entered back into a slow period during which volunteer presence in Apia is close to nil. There are a couple of us around. I invited people over to my house to play Euchre on Friday night. I’m always down for a card game, and my house is cheaper than hanging out at a bar or restaurant around town. And the music’s better. Most of Saturday was spent teaching and laying on the couch. Eventually Jordan and Koa and I met up to see “The Hangover” at Magik Cinema. I liked it very much. My favorite parts were the Phil Collins “In the Air Tonight” moment, which kinda makes me miss Brian, and the Rain Man homage, which I found hysterical and no one else in our theatre understood. Jordan suggested we stop at McDonald’s on the way to the theatre for ice cream cones. The $2 WST ice cream cones are a Samoan favorite in the middle of a hot day or for a late night snack. All in all, the ice-cream-and-a-movie evening made for quite the man-date. It rained today. 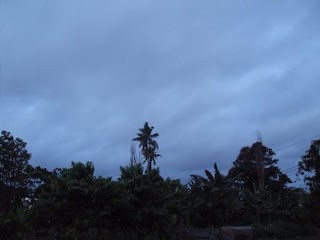 Sundays in Samoa are quite a low-key affair, but if there’s one way to bring down the energy level even more, it’s rain. My plan of taking a 2-hour nap turned into a 3.5-hour nap, which I was fine with. It’s not like I had much to do anyway. And thus a low-key, relatively cheap weekend comes and goes. And I still feel like I could use another nap. I hope you’re well-rested. Pictures below. 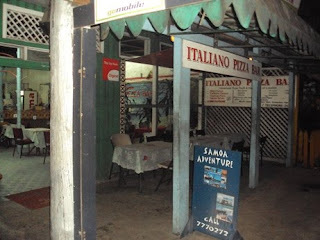 Italiano Pizza Bar. Opens at 4 o'clock in the afternoon. 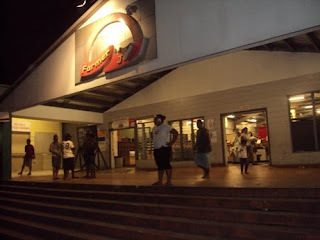 They serve beer on Sundays, but it's not fa'asamoa to order one. 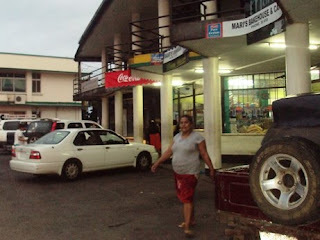 Mari's Bakery and Faleoloa. Their kekepua'a is top-notch. Farmer Joe's Grocery Store. Open 'til 9:00 p.m. I'm glad you liked the Hangover!! I thought the Rainman part was really funny too, but no one else got it either. I saw it twice & both times I tried to explain it to the people I was with but they didn't get it. Twinsies! I can't wait to see you! !